Hemodialysis vascular access remains a major challenge for the nephrology community. While the benefits of an arteriovenous fistula (AVF) with regards to morbidity and mortality are well-known, >80% of patients in the United States initiate hemodialysis with a tunneled dialysis catheter (TDC). Reasons for this scenario are multifactorial including extended surgical wait times, patient refusal of surgery, early thrombosis, maturation failures, and additional procedures to allow for usability. There has been little in the way of surgical advancement in this area since the Brescia Cimino procedure, and the field of vascular access creation has been relatively stagnant. In a recent AJKD publication, Lok et al present the results of the Novel Endovascular Access Trial (NEAT). The trial was designed to examine the safety and efficacy of a new percutaneous system for the creation of an AVF. This procedure seeks to bypass open surgery to form an AV fistula by allowing the operators (surgeons and interventionalists) to create a functional access through an endovascular approach. The procedure involves the use of ultrasound-guided access into the venous and arterial system in the arm, which is followed by fluoroscopic localization of two catheters (arterial and venous). The catheters are aligned via a magnetic mechanism and a radiofrequency electrode is then used for the final step of fistula creation. Figure 4A from Lok et al, AJKD © National Kidney Foundation. The everlinQ endoAVF System. Abbreviation: RF, radiofrequency. Figure 2 from Lok et al, AJKD © National Kidney Foundation. Endovascular arteriovenous fistula (endoAVF) procedure steps. 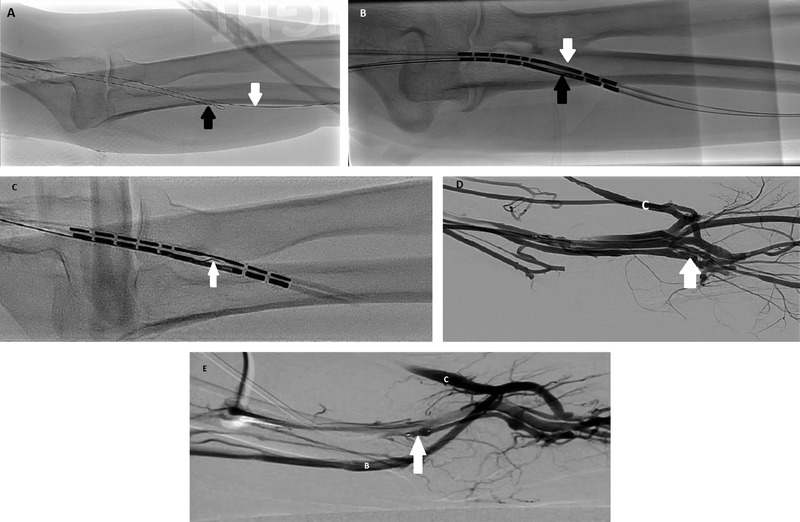 (A) After entering the brachial vein with a 21-gauge needle, a 0.018-inch guidewire is advanced through the needle to the ulnar vein (black arrow) under fluoroscopy, and a 7Fr sheath is inserted. White arrow indicates wire in the ulnar artery. (B) Next, access to the brachial artery is similarly achieved; a guidewire is advanced to the ulnar artery, and a 6Fr sheath is inserted. The everlinQ venous catheter is advanced to the ulnar vein (black arrow), and arterial catheter, to the ulnar artery (white arrow) under fluoroscopy. 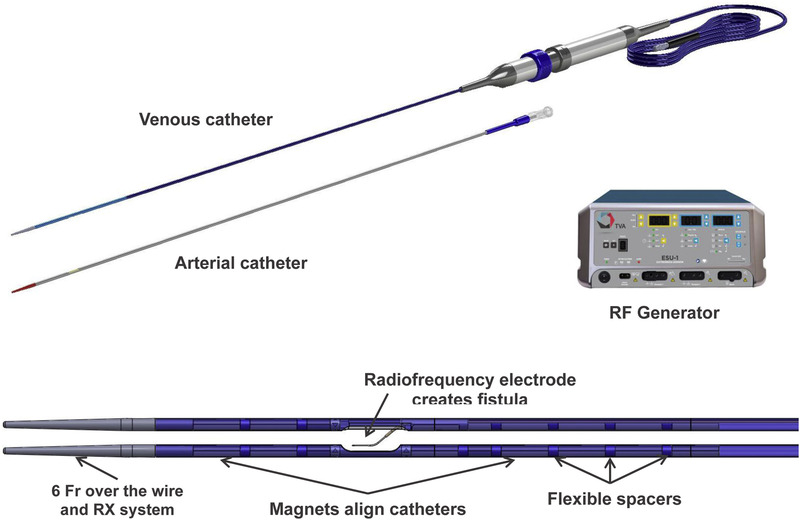 (C) Magnetic catheters align and then the radiofrequency electrode is deployed (white arrow). (D) After removing catheters, the endoAVF (white arrow) is confirmed with brachial artery contrast injection. (E) One brachial vein is embolized to divert flow to superficial veins (arrow; Amplatzer plug in embolized brachial vein). Last, the arterial sheath is removed and hemostasis attained per institutional practice. Abbreviations: b, basilic vein; c, cephalic vein. Note: If the operator did not use a vascular closure device during the procedure to attain hemostasis, participants had manual compression over the puncture sites for 15 to 20 minutes and then they were covered with a simple adhesive bandage. Additional adhesive dressings, bandages, and supportive wrappings were discouraged. Figure 3 from Lok et al, AJKD © National Kidney Foundation. In the NEAT trial, 80 patients were enrolled (20 roll-in and 60 in full analysis). Their results were excellent, with EndoAVFs successfully created in 98% of participants. 87% were physiologically suitable for dialysis as measured by blood flow rates and vein diameter; the functional usability rate at 12 months was 64%. Moreover, the 12-month primary and cumulative patencies were 69% and 84%, respectively. These results demonstrate that such a technique can provide equivalent, if not superior, outcomes compared to an open surgical technique. Adverse events including pseudoaneurysm and inadequate hemostasis occurred in 8% of participants; these complication rates are lower than those reported for surgical AVFs. As an interventional nephrologist, I am certainly thrilled that such a technique is being investigated to add yet another tool to allow me to improve the management of my patients. While limitations with regards to the highly selective nature of the final cohort exists (only 60 of an initial 183 eligible patients were deemed suitable for the procedure), the possibility of a randomized control trial comparing this technique to our current surgical approach is exciting. This minimally invasive endovascular approach may provide an alternative to patients that have “surgical fatigue” or have failed traditional access creation. 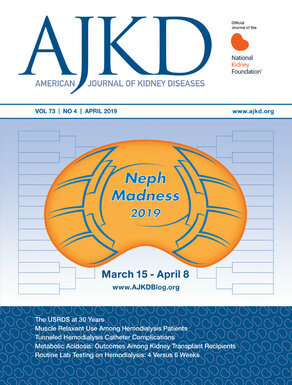 To view the Lok et al article full-text (Open Access), please visit AJKD.org.